If party guests start screaming and climbing on tables, it's probably because they just saw this big creepy rat decoration! 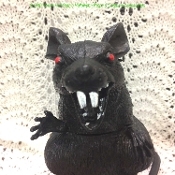 The realistic scary looking rodent is a classic horror decoration with blood red eyes, menacing teeth, and a long black tail. A ghoulishly great addition to any pirate, haunted house, cemetery graveyard or dungeon scene. Add this spooky mutant creature to your Halloween house! Durable Heavyweight Plastic Black Giant Rat sits reared up on its haunches, ready to scare anyone that happens to wander into your house or yard this Halloween. This frightening rat is approximately 7 inches tall and features beady red eyes, pointy white fanged front teeth and bony paws. Indoor Outdoor use. Heavy enough to not blow away!